Shares of the truckload carrier climbed the most in nearly a month, up as much as 4% intraday and closing at $108.90 July 30 after Stifel analyst J. Bruce Chan cited a “robust freight environment” in his note titled, “The Schwartz Is in You, Landstar; Going Plaid and Upgrading to Buy.” The title appears to be a homonymous play on the movie’s main character’s name, Lone Starr, and the optics that result in the movie when traveling at “ludicrous speed,” a pace that exceeds the speed of light in the “Star Wars” parody by Mel Brooks. “Landstar is a solid operator with better access to capacity than most asset-light players in a historically tight market, in our view,” wrote Chan. The stock led the Russell 1000 truckers index July 30 and has gained 33% in the past 12 months as concerns around the U.S. trucker shortage weigh on other businesses and the economy. Landstar can distinguish itself from peers with its strong pipeline for new agents — who ultimately drive volume through its network, wrote Chan. Analysts from Morgan Stanley and Oppenheimer also shifted their outlook on the company following second-quarter earnings results July 25, raising their third-quarter estimates. Oppenheimer analyst Scott Schneeberger wrote that strong demand and tight industrywide truck capacity will continue to create favorable business conditions. While the market appreciates the favorable demand and supply dynamics, “We’d seek to be opportunistic at advantageous entry points,” he said. 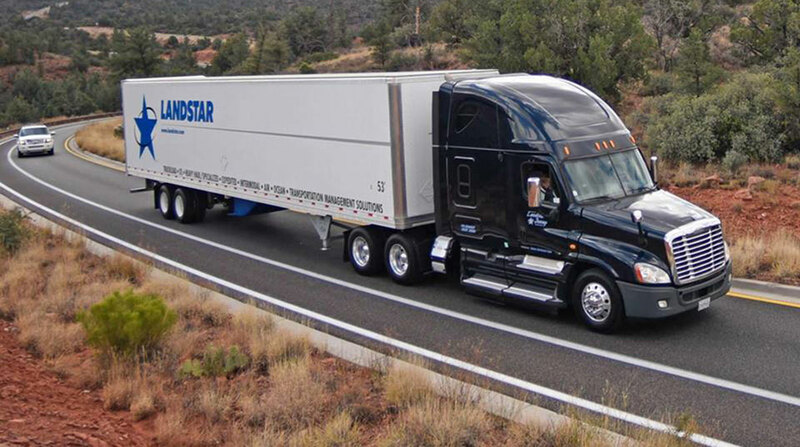 While Landstar missed on second-quarter operating income, the company’s performance wasn’t reflective of the numbers, according to Chan. That’s because elevated insurance and claims weighed on margins. A lower tax rate for the freight carrier was another tailwind for the company in the second quarter, Morgan Stanley analyst Ravi Shanker wrote in a note upping the carrier’s price target to $98 from $96. Shanker increased third-quarter earnings estimates by 18 cents to $1.58, though remains one of the two analysts with a sell on the company, according to data compiled by Bloomberg. Landstar ranks No. 10 on the Transport Topics list of the Top 100 largest for-hire carriers in North America.